Three Things to Know before Seeking Polyamorous Love. *Polyamory: The philosophy or state of being in love or romantically involved with more than one person at the same time. Polyamory isn’t a fringe topic anymore. And for the record, it’s not polygamy. But every conversation I’ve had recently about polyamory has had some mention of polygamy, even if it was just a passing joke to make the distinction. Sally, an executive with a reputation to protect, confessed that she has never felt such freedom in her heart, since she has become romantically involved with two other people. Because, Sally, we have been programmed to believe that it’s impossible and wrong to intimately love more than one person. The reasons we believe this are complex and connected to the survival of the ego. 1.~Poly love must be entered into with the same commitment to honesty, respect, and transparency as any other relationship. Every relationship is subject to these cornerstones, and just because we swing from the chandelier with more than one lover, doesn’t mean that we can skip honoring our love in this way. When it comes to dishonesty, don’t accept anything in poly love that you wouldn’t accept in another relationship. Poly doesn’t mean “no rules” unless you’ve all agreed to it. Even with no rules, we have to observe the other people’s boundaries about having no rules. If you’re entering into a new poly love and feel that all partners aren’t on the same page about certain requirements, have a discussion about it. If things don’t feel right, don’t do it. Make sure that you state your needs clearly. Often we don’t get what we want from a partner because we have simply failed to ask. If they’re angry because of your honesty, then this is a clue about the longevity of the relationship. 2.~Jealousy is the number one killer of poly relationships. Sally is fighting jealousy issues with the other woman in her polyamorous relationship. When she needs time alone with their shared lover, she feels resented. But isn’t it normal to feel jealousy? It means we care, right? If my partner isn’t jealous, I question their love. Jealously is tied to the ego. The ego is good because it’s a safety feature that keeps us alive, like a guardian of the soul while we reside in a physical body. It is required for the flight or fight reflex. If we use the ego for more than this, it turns into a monster who needs to be fed a constant diet of reassuring platitudes. The binky, toy, or blanket was given to us for the purpose of assuring our safety. If you have this, you will feel safe. And we learned the word “mine.” The ego drives the key hang-up about not wanting to share something that is “mine.” This special object, or later, a person, becomes integral to our survival. Except now, it’s the survival of our ego that is at stake. But at this point, we can’t tell the difference. To love without attachment and in complete freedom is difficult for most of us. Not all attachment is bad. Attachment is appropriate at some levels. For instance, a child-parent bond is a form of necessary attachment, where the child can rely on their parent’s care and protection. Attachment becomes dangerous when it slips into obsession and inflexibility. In any relationship, jealousy and possessiveness are reactions to fear, and specifically the fear of loss. Love does not consider loss, but it considers freedom as a key component of its manifestation. Jealousy has to be met like a fire-breathing dragon. There is no way past it. If jealousy is a feature in our relationship, there is work to do. We don’t need to give up on our poly-love, but each person involved will have to face their fears and move through them. Good questions to ask: Why am I feeling this way? What am I afraid of? Allow room for all partners to be human: This is just a normal part of soul growth. Communication is key. This is something we face in any relationship. Resist the temptation to expect that your poly love is forever. Even if it isn’t, all love is wonderful if it is nurturing and uplifting. Longevity is not the only marker of a worthwhile relationship. Society has depended on the ideal of forever love to keep order. But other types of love contribute to healthy human relationships. I think polyamory is opening the doors to return to a more communal life, which was once a part of human history. Sally is being admonished by her friends and family because the polyamory she’s involved in can’t possibly last, and they list all the ways it can fall apart. To be fair, they don’t want to see her hurt. So why tempt fate by loving more than one person? Even one is a risk. People who are attracted to poly love are not interested in risk management, as a rule. They are, by nature, risk-takers. They may not be attracted to skydiving or investing in the stock market, but where their hearts are concerned, they are willing to explore with abandon. All love is throwing oneself into the abyss of not knowing. Poly love is brave. Poly lovers are intrigued by how expansive their hearts can become. Poly love acknowledges the possibility that maybe we’re not created to love only one person and hang on to them for dear life. Sally constantly has to explain how her heart works. She is asked: Why is one not enough? Why can’t you be normal? Sally can no more deny what her soul seeks than a quantum physicist can keep from questioning how energy works. Sally is an adventurer, seeker, and explorer. She is a pioneer. Maybe the world is not ready for poly love, or maybe we’re just waking up to the idea of multiple loves. When explorers left the shore to look for other continents, they didn’t know where they were going. They only knew that they had to go and answered the call of something that felt right in their hearts. Poly love isn’t for everyone, but for those who explore it, it is more often a necessity than a whim. On a side note, if someone has difficulty in regular relationships, poly love isn’t necessarily a cure for this. Many people attempt poly love as a way of fixing dysfunction in their current relationship. Adding more love to a broken love is tricky, and it requires committed introspection. Be just as judicial in choosing poly lovers as you would be in any other situation. Align with likeminded souls. Self-love, self-awareness, and a natural tendency toward empathy are great qualities when exploring polyamory. Poly love will only be as complicated as we make it. The things we bring to it are in our control, but everything else isn’t. This is the beauty of polyamory: discovering what works, what doesn’t, and finding our center. 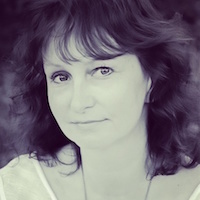 Wild Woman, Witch, Intuitive Coach, Monika lives for the moments where words meet spirit. A daughter of change, she lives on the magical shores of Vancouver Island, B.C. guiding kindred spirits on their sacred journey through life, sexuality and relationships. She is the creator of the “Healing Mother Wound through Divine Feminine Wisdom” Workshop leading women worldwide to their sovereignty and empowerment. This Scorpio loves nothing more than to wander the Underworld and cast spells under a full moon. Monika is also the author of The Dark Pool Trilogy, a delicious tale of erotica, pagan mysticism, and polyamory available through major online book outlets. She can be reached for coaching and mentor-ship via her website, Instagram, or Facebook.